in ‘before minus now’ Chalayan focused on invisible forces as a means to construct form. The designer was particularly interested in phenomena that become visible entities. He explored the powers of expansion, magnetism and erosion and how these can be applied to garments in order to create shape. 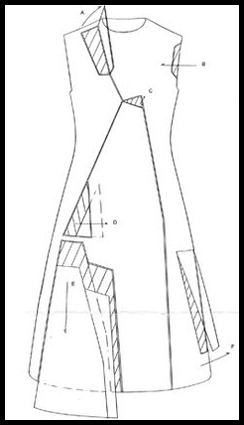 To express expansion, Chalayan used heat to modify the shape of a flared red dress. Harking back to the 1950s New Look silhouette, Chalayan’s take on the feminine dress was inflated on stage where it unfolded and amplified in volume. 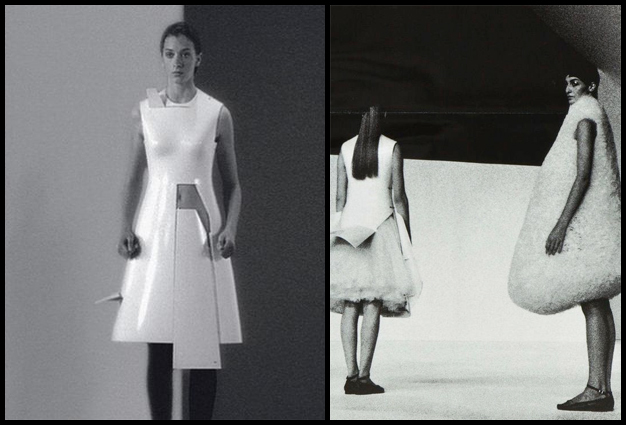 Then, Chalayan’s fibreglass, remote-control Aeroplane Dress was transformed with the touch of a button. The body was consequently metamorphosed through an artificial, man-made force that combined the elements of magnetism and technological advances. To embody the action of erosion, Chalayan shaved a bale of shapeless pink tulle giving it the contour of a dress. In the same way that the formation of mountains occurs through natural erosion, Chalayan formed his own monuments through the gradual cutting of the fabric. In the finale, five models were presented, wearing deconstructed corsets in vivid colours with matching pleated skirts. With the designs, Chalayan paid tribute to the natural force of the wind as a powerful tool that can alter and create forms.